Airport - The Highest Flying Cinematic Disaster Series Ever! Ahhhh the cataclysmic 70’s, when disasters were everywhere and came in all sorts of manmade/nature scenarios. Everywhere you turned there was destruction at the movies and audiences relished seeing big name stars get crushed, crash, drowned and incinerated on movie screens. Recently I went back and gave myself a crash course reminder of the 70’s disaster genre with a nail-biting double-feature of 1970’s Airport and the series second sequel Airport ’77. This was way back when air travel was still somewhat a fun experience and the term ‘stewardess’ was still acceptable to use. 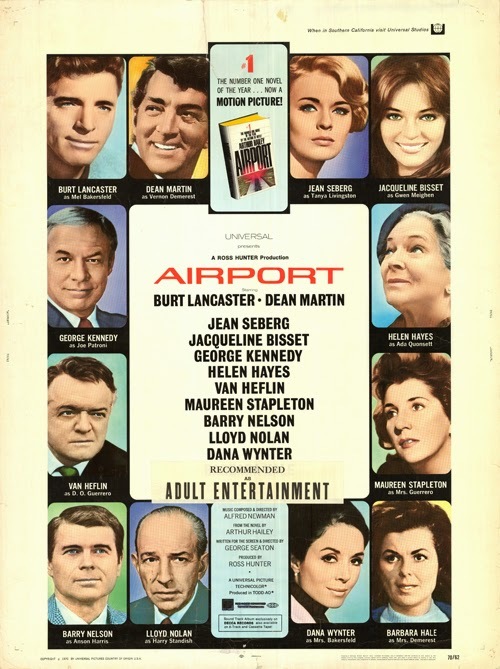 Based on Arthur Hailey’s best-selling novel, Airport gathered an all-star cast at an airport, threw them onboard a plane and subsequently had it start falling from the sky like a weighted bag of airline peanuts, threw in some melodramatic subplots between them trying to land the blasted thing in one piece. It’s all pretty good fun. Burt Lancaster as the airport manager and George Kennedy as its chief mechanic scramble to clear snow-covered runways as Captain Dean Martin’s aircraft comes hurdling down from the sky. The Rome-bound 707 is the victim of a crazed guy with a bomb that blows a hole in the plane, a lot of papers fly around and it all has the passengers screaming. However, it’s not all tension and suspense-filled at the airport. There’s some soap opera-type drama with wives and mistresses and dinners sitting getting cold for our dedicated airport workers. Much of that is very hammy and as dull as planes circling around in the sky. The film isn’t a great one and certainly feels clichéd after the countless imitators and the classic parody film Airplane!, but there is sort of an old school charm to it watching these actors clench their teeth, look up at the sky or at a back-projected runway and then dramatically yell really loud. Airport was a monstrous box-office hit, and eventually it spawned three sequels. 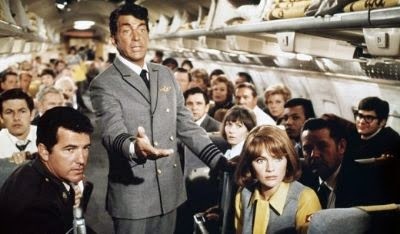 Each film consisted of…..well a planeload of passengers in peril, along with that melodramatic crap. 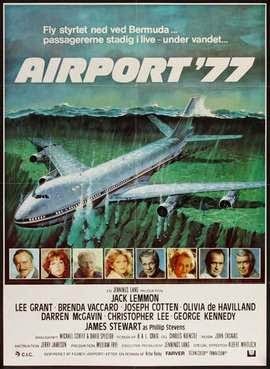 Airport 1975 followed with Charlton Heston as its main star and then came Airport ’77 with Jack Lemmon as the lead, which was my second film in my Airport double-feature. I always thought it was kind of funny how this film series didn’t even bother coming up with new names for the films – they would just tack on the year after the Airport name. I have to give credit to The Concorde: Airport ’79 for at least changing things up a little bit. Unlike facing the enemy of gravity, Airport ’77 did some renovation with the old ‘crash and burn’ idea and this time had the passengers face drowning. A luxurious, state-of-the-art airliner – this thing is really top-of-the-line, passengers can play pong onboard – is transporting some priceless artwork for philanthropist James Stewart. Some hijackers who are planning to make off with some of its treasures inadvertently bring the plane down in the Bermuda Triangle. The plane sinks into the ocean, rests at the bottom with water slowly leaking in and disaster panic begins. Seeing Lemmon be something of an action hero is kind of weird. I always liked him, but seeing him get to be a bit more macho and authoritative than his usual roles is something audiences don’t often see. Naturally the rest of the cast consists of name celebrities – Brenda Vaccaro, Darren McGavin, Lee Grant, Jospeh Cotten, Olivia DeHavilland, Christopher Lee, but we also get some new young faces strewn about including, Gil Gerard and Kathleen Quinlan. Along of course with George Kennedy. Once again, it’s not a terrific movie and now plays more like a television-movie-of-the-week. However, the airport disaster motif is still fun and the fact that this time they’re not desperately looking for runway lights, but trying to get out of a plane at the bottom of the ocean makes things different enough to hold my interest. It’s like a cheaper version of The Poseidon Adventure. I did question the fact the plane seems awfully shallow for supposedly being at the bottom of the ocean though. It seemed like it should have been much deeper and inaccessible than how it’s played in the film. But whatever. The Airport series drew its final breath with The Concorde: Airport ’79. I haven’t seen it yet, but maybe I’ll check it out. By looking at the cast list you can clearly see the shine was coming off the Airport franchise. What started as a series with Lancaster, Martin, Heston was now featuring Robert Wagner, Jimmie Walker and Charo. 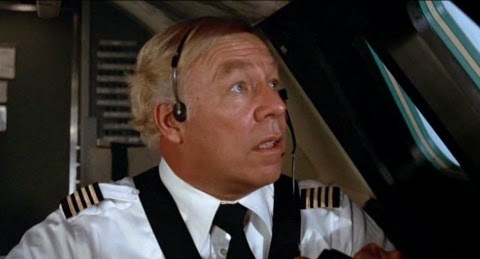 At least they still had George Kennedy.